Looking at charts a mile long is TOO HARD TO FOLLOW. First of all, I don't think you're going to find a board that will take two widely different CPUs. Second. A program which will run on all hardware probably hasn't been written yet. If you want to stick to CPUs that will run some kind of DOS then almost any diag proggie will do the trick. They pretty much all do benchmarks. Snooper is my favourite, but Amidiag is readily available too. I just looked in my collection and SI.EXE compares your current CPU to three standard ones: Compaq386/33MHz; IBM AT286/8MHz; IBM XT 88/4.77MHz. Make yourself a boot disk to move around units. If you really want to compare an 8008 to a quad core whatzit (QCW) then I suggest you go back to some list and just use grep. Perhaps make some little script to fit your needs. Text is your friend! I'm not sure what one can use those kinds of numbers for anyway. Real world variables will turn them into nonsensense. I've got a P133 that runs circles around a P4/2.8GHz processor because the software is radically different. You're obviously going to run different software on different machines, and you won't want to (or be able to) run any one particular piece of software on all machines. What is your intended purpose for this information? I guess it depends on how you define speed. If all you're looking for is raw number-crunching power, you might want to take a fairly simple algorithm like the Sieve of Erastothanes, and adapt it to assembler for the various platforms. Maybe not quite what you want. But for modern x86 its pretty good. it's almost impossible to accurately make benchmark comparisons between CPUs as widely separated as say an 8088 and a new quad core or even a pentium 1.
the reason is that if you want to benchmark an 8088 or 286's performance you're going to be using 16-bit operations. if you move to a newer CPU like a 386/486/pentium/newer, and you run those same 16-bit benchmarking operations on it... it isn't going to be performing even close to it's maximum ability because those kinds of chips can handle 32-bit operations. i guess the most accurate way of going about this is devising a big series of operations for a benchmark, but have two versions of this benchmarking program compiled: one coded for 16-bit processors, and the other designed to do the same logical operations but optimized with 32-bit instructions. actually, here i made a comparison for you to save you the trouble. Last edited by Mike Chambers; February 8th, 2009 at 11:44 PM. 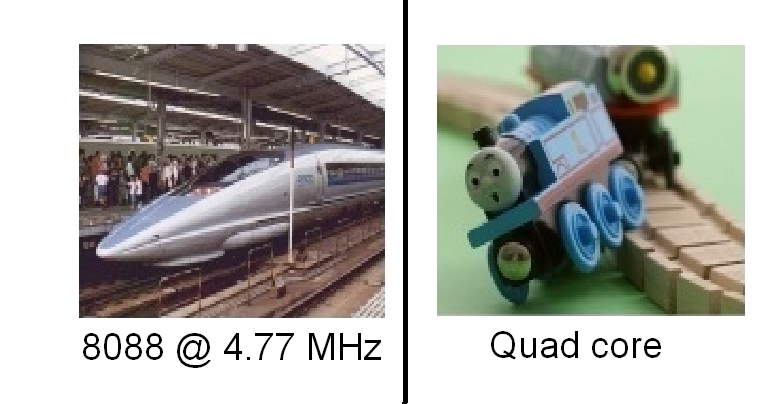 The question is... Quad-core what?